Flights to New Zealand Capital Grounded as Former Cyclone Gita Hits - Integration Through Media ....! 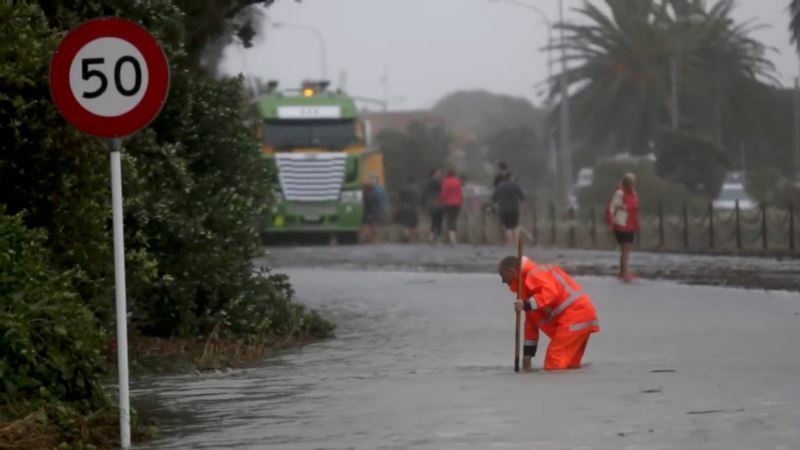 (VOA): Air New Zealand on Tuesday cancelled all flights in and out of New Zealand's capital, Wellington as the remnants of tropical cyclone Gita pummeled the country. Prime Minister Jacinda Ardern told reporters at Parliament that military had been deployed to areas likely to be worst hit and the country's national Civil Defense office in Wellington was on standby to help local authorities. The cyclone had since been downgraded to a storm, but forecasters warned it was still likely to wreak havoc as it traversed the center of New Zealand, parts of which were still reeling from a huge storm that prompted authorities to declare of states of emergency at the start of February. Transport authorities shut a stretch of highway along the east coast of the South Island and the Department of Conservation was closing picturesque seaside hiking tracks and campsites along the West Coast and ushering tourists away from low-lying areas, media said.